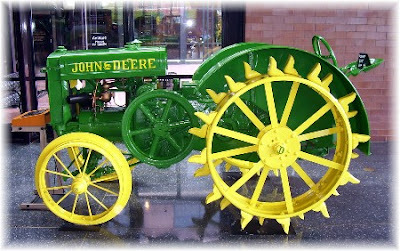 I like tractors and enjoyed visiting the John Deere Visitors Center in Moline Illinois on Tuesday, as well as seeing all the antique tractors at the Iowa State Fair yesterday. I thoroughly enjoyed hearing the John Deere put put as the owners proudly started their tractors. Here's the John Deere tractor song especially dedicated to my friend John Zimmerman. We also visited the Amana Colonies in eastern Iowa and, interestingly, this is my favorite photo! 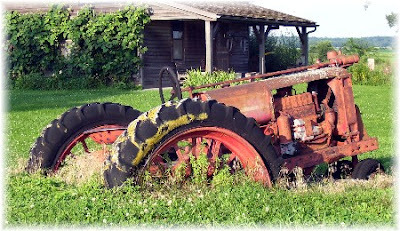 We don't know the story behind the sunken tractor, but it appears the driver got stuck one day and decided he was done with farming. Amana Colonies is a nice little German village with an interesting history. There are several quaint shops and eateries as you walk along the very clean and nicely manicured yards. 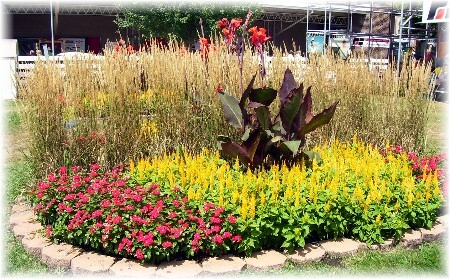 The Iowa State Fair is huge and beautiful, certainly the pride of the state of Iowa. They have colorful flowers like this all through the fair grounds so Brooksyne studied the quiet flower arrangements while I listened to the noisy tractors.